As a freelance web designer, income can be very unstable and inconsistent. One month, you feel like Scrooge McDuck, with a huge amount of cash coming in–but the next? Your income drops way down, or maybe you don’t make anything at all. Some months you might even lose money! This is really common, so if it’s happening to you, know that you’re not alone. Everyone goes through this stress at some point. 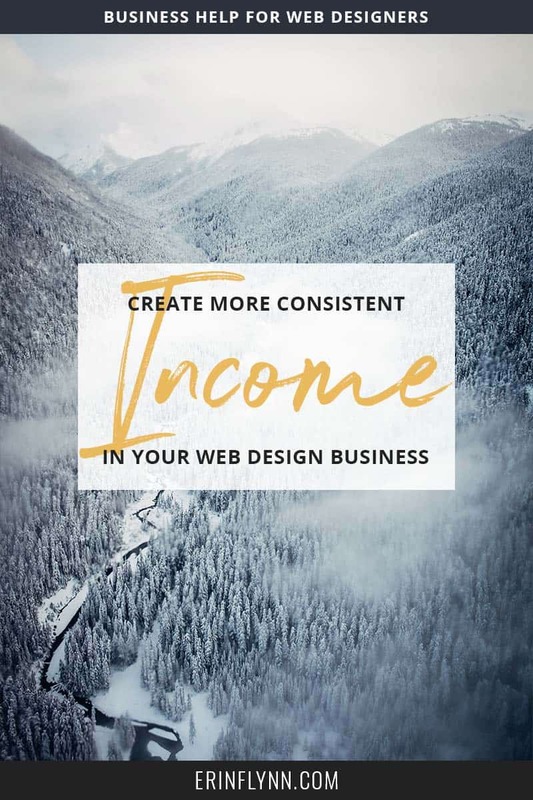 Fortunately, there are ways you can create more consistent income in your web design business and keep that cash flow coming in each month! Before you can create consistent income in your web design business, you first have to know how much money you need to make each month and how many websites (or other offerings) you need to sell in order to reach that income goal. Take a minute and figure that out. Then figure out how long each project will take. For our example today, we’ll say we want to make $5,000/month, and our websites cost $5,000 and take eight weeks to build. That means we need to sell one website per month, and we’ll be working on two websites at a time. Not too bad! Your numbers may be different but you need to know them, so that you know how many websites you need to sell each month, and how many you’ll be managing at a time. Now that you know how much money you need to make and how many websites you need to sell each month, you need to figure out how to get that cash coming in consistently. Since you also know that each website takes about eight weeks to build, you can split the payments from your clients in a way that gets you paid each month. Instead of making payments due when you hit certain milestones in a project, make payments from your clients due at specific dates in the project. You should always get paid prior to doing the work, so you get an initial payment to hold the spot in your calendar (this also ensures that if the client disappears, you have some money to get you by while looking to fill the spot again). This payment covers the first month of work. Then, 30 days into the project the next payment is due, regardless of the progress. This means that clients can’t delay payment by taking too long to give feedback or give you things like content. It also keeps the project moving, because when the client is paying based on date, they’re more likely to actively participate and not slow things down. This payment every 30 days continues for as long as the project is scheduled for. So for our example, we’ve got a website payment of $5,000. We’ll split that into two payments: The first payment is due before any work begins. It covers holding the spot in our calendar and the first 30 days of work, so we’re paid in advance which protects us if the client disappears. The next payment is due 30 days into the project and covers the next 30 days of work and website launch. That means that we get $2,500 coming in each month from a single client, for two months. Since we want to make $5,000/month we need that second client paying the same amount, and then we are covered and good to go–knowing that at least for a few months, we have steady cashflow. While it’s totally possible to create consistent income selling websites each month, the easiest way to ensure you have consistent income each month is to add some recurring revenue services to your business. These are services that your clients will pay for month after month for an extended period of time, and are the best option for creating consistent income. Recurring revenue can include services like website maintenance, design or development retainers, website hosting, and more. Some of these are more work than others, so you do need to take into account how much time each will take and whether such offerings fit into the kind of business you want–but if they do, they are a fantastic option to create consistent income and continue working with clients you already like instead of hunting down new ones. For our example, we’ll say that we get five clients on a graphic design retainer for $500/month (each) where we create blog post images, social media images, and other similar work each month. That means we’re getting $2,500/month from our graphic design retainer clients, which also means that if we want, we can take on just one new website build per month, instead of two. And, because we know our retainer clients need ongoing work, we have a fair amount of stability with this income. We don’t have to look for as many new clients, we can keep working with our past ones, and not have to hustle nearly as much to attract and land new clients. Creating consistent income in your web design business doesn’t have to be a huge struggle. First, figure out how much money you need to make each month and price your services accordingly. Then, split the payments from your clients based on date (not milestone) so that you get paid every month, regardless of the project’s progress. And finally, add in recurring revenue, so that you have consistent income for extended periods of time (even indefinitely), and don’t have to hustle up as many clients each month. How much money do you really need to make? I help web designers streamline their systems, communicate with clients, and create a more profitable business so that they can spend more time doing what they love--making websites--and spend less time stressing out.